The official release of phpBB™ 3.0 "Olympus" is now available. My scripts for the conversion of the actual coopordie player list are finished and tested. 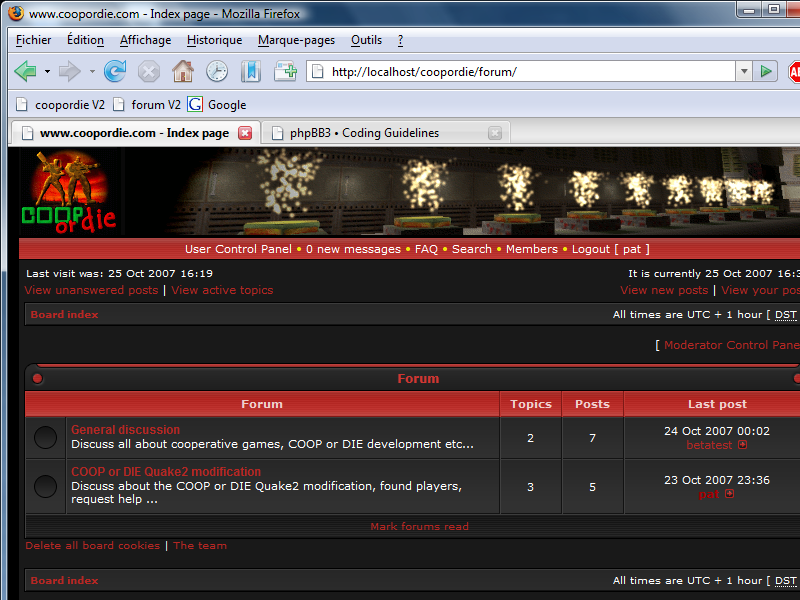 I'm only waiting for the QuakeSrc.org admin to export my old coopordie forum. I hope to be able to launch the new coopordie website merged with the forum before the end of the year. The merge of the worldserver code and database with a phpBB forum is almost done. I need to make some improvement to the player profile page, some cosmetic enhancement, and a complete test. When I will have a valid version tested locally, I will migrate the 3000 players account to the member list of the forum. After this update, registering on the forum will replace the actual COOP or DIE registration process. I've finally rejoined the right side... LINUX ! For Quake modding, my use of GtkRadiant, GCC, Code::Blocks, GIMP and other free tools will remain the same. 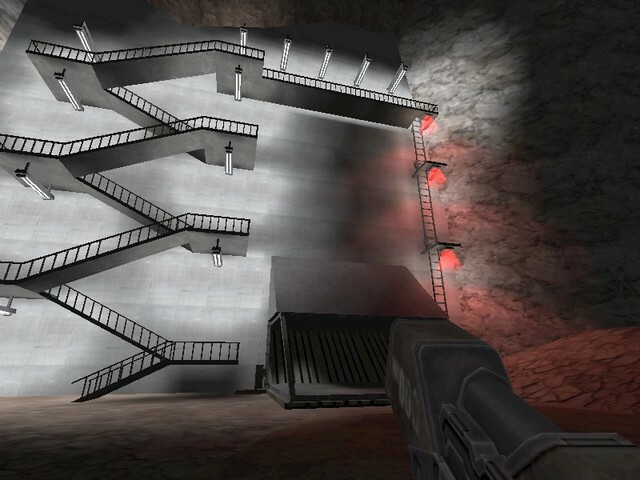 One cool feature that could probably be expected for the next months, is a Linux release of COOP or DIE for Quake2. 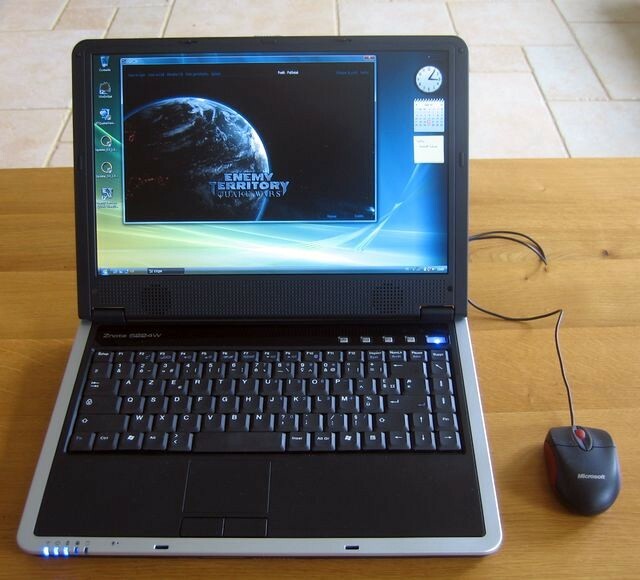 An Intel® Core™2 Duo 2,20Ghz, 2GB of DDR2 RAM and a NVIDIA® Geforce 8600M GT 512MB all in a 14.1" notebook ! 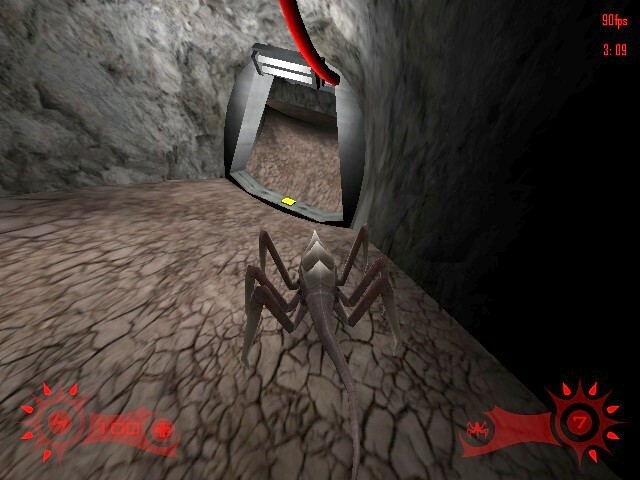 The player's base of COOP or DIE for Quake2 grow months after months at it's quiet rhythm. Like a lot of ancient players come back regularly, the number of game played each days is in constant augmentation. The number of players per game also increase. In the past, most people were playing with one friend or just alone, taking a look and waiting for a teammate. Now most games are played by three or four players. I'm back from holidays, and ready to take an inside look at the Tremulous bot framework made by andi christ (cyr). After a first start with my habitual tool Microsoft Visual Studio, I have chosen to follow the majority of tremulous developers and modders. I have switched to the GNU compilation tools. 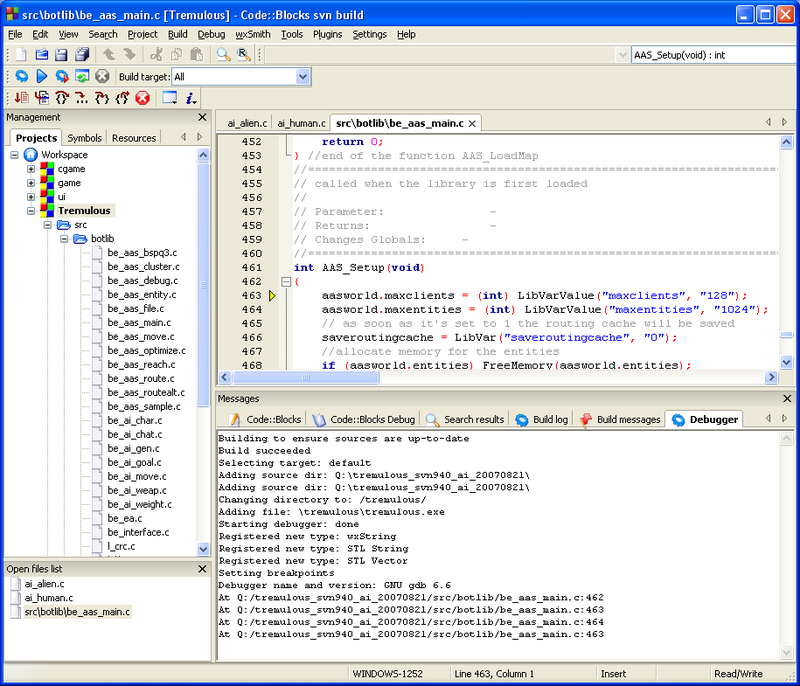 Using MinGW and MSYS for compiling the source code of Tremulous wasn't difficult with the help of this guide. But I would like to retrieve the same level of comfort I was used to with my previous IDE. By the way, I have tried Code::Blocks, and be very happy of it. After one decade of resistance to what I consider to be a hard drug, I have finally fallen into MMO. 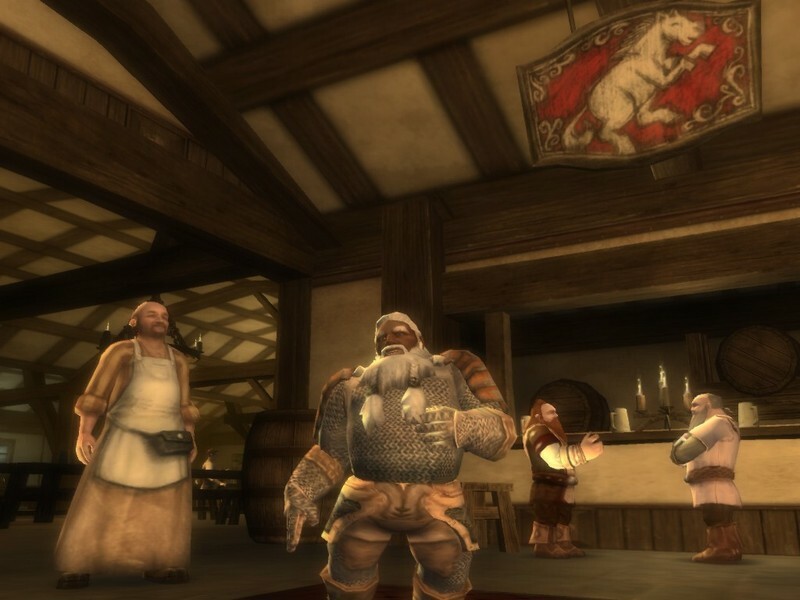 I've bought a Lifetime Membership to the Lord of the Rings Online. It is a really good gaming experience. I like to play with my guardian. The ambiance between all players on the role-play server is really good. I'm currently not a member of any Kinships (guild), but I've enjoyed every fellowship (group) I've played with. Inevitably it take a big part of my spare time, and my development projects are slowing down. Today I have modified the internal code of the COOP or DIE webchat for preventing spam bots. It is a minor modification without anything noticeable by classic user. It seem to work and I haven't noticed any new spam in the webchat since the update. The spam problem make me a little angry about the future merge of PhpBB with the COOP or DIE worlserver. I plan to only allow users to post messages in the forum after their first ingame connection to the worlserver. I think spam bots will have some difficulty with that. Of course an alternative to the forum will be used for providing support to player who have problems to connect. Something like a direct message to the admin will do the job. What's happen since the last four months ? Well, I have sold my XBox 360, I have bought a WII, and after played to the European Lord of the Rings Online beta on my PC, I have pre-order the game. The engine will handle the identification and connection process with the worldserver. It will also provide an API for the game dll/qvm. It's the generic and low level part. The game dll/qvm will only manage the data related to the game mode. It's the specific and high level part. This partition will be more conform to the Quake software architecture. It will also be more easy to use it for other Quake3 project who want a centralised players account system.